Organizational change can often be a frustrating and confusing time. Understandably, many employees are hesitant and weary about change. 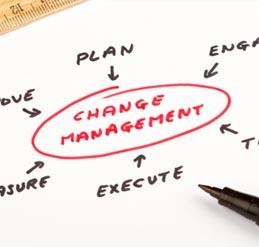 Conversely, the champions of these change efforts are often excited and energized about the changes and do not understand why the employees don’t feel the same way. In an effort to align everyone involved in the change process and achieve more successful results, we have created a simple checklist for you to use when your organization is undergoing any type of large-scale change. The following list represents the key activities you need to perform during all of your change efforts. It also provides a sampling of the questions that lie beneath them. Change readiness survey Is the organization ready to change? Organizational & job impact assessments How much of a change is this for the organization overall? What type of impacts will the change have on individual job functions? Communications audit What vehicles do we currently use to communicate with our employees? Which ones will be most effective during this change effort? Audience assessment What are the unique characteristics of the groups we are communicating to? What specifically is important to them? Communication strategy & plan What is the best way to communicate these changes to employees? What frequency is appropriate for our organization? Stakeholder analysis Who has something to gain or lose with the success of this project? Which leaders will champion this project and remove any roadblocks for us? Employee commitment activities What are we going to do to build employee commitment to the change? Training requirements Who are we going to train? What facilities will be available to us? Who will lead the training sessions? Training strategy What is the most effective way to facilitate our training programs? Should we develop CBT programs or have instructor-led training? Team performance survey How effective is the project team? Do they have effective leadership and communications? Do they understand and are they committed to the project objectives? Team rewards and recognition How will we motivate the team to achieve high performance? What will we do to continue motivating individual team members? Can Plus Delta help you improve performance through Positive Change℠? To learn how you can produce positive changes in your organization, give us a call at +1 (310) 589-4600 or send an email to info@plusdelta.net.